In the past, any attempt to schedule the time of day the posts go up immediately falls apart like the escape plan in a zombie movie. If I am on top of the ball, I have had someone quick edit my article the night before and it goes up around 10am. But other days that I emerge from a waist-deep pile of Diet Pepsi cans and 5 Hour Energy Shots at six or seven at night, and reach with a shaking hand to hit "Publish" before I fall into a coma. NOTE: I will regularly skip days if I am working on a fiction piece. So please imagine Geoffrey Rush with bad teeth telling you that these are more like guidelines, really. I'm also about to start teaching summer school for six weeks. That may throw a wrench into some of the updates during those six weeks, but this schedule should be good for the foreseeable future. Mon- Some kind of "main article." Writing About Writing observes bank holidays and takes every three day weekend it possibly can. Mostly because I'm lazy, but also I don't want to pay the staff overtime. Tues- Supportive and Unsupportive Girlfriend both claim Tuesdays as date day (often tag teaming me all day long--and not in the good way). If I have a guest blogger to present (and I LOVE guest bloggers) I'll post them on Tuesday. Otherwise I have a Mai Tai and put my feet up on a sun-kissed beach, which might look to the layman like getting cat litter from Costco, but don't be fooled. Wed & Thurs- Shorter posts find their home on Wednesdays and Thursdays. An update on personal goings on, a writing prompt, maybe some link pimpage. These are the sorts of things that tend to happen in the middle of the week. Sundays- I really, honestly try to take Sunday's off. 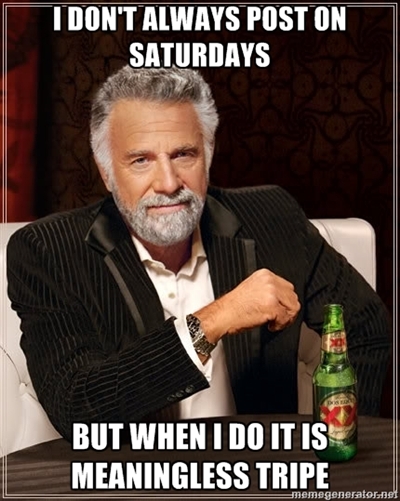 Or Saturdays. Or at least one day. Sometimes. The problem is that content means hits, so a day where I don't do anything can have half or less the traffic of a day where I post anything--even if it's just five links with a sentence each of commentary on them. Even the cheesiest entry represents at least 200-300 page views if you're ever wondering why I seem to complain about never getting a day off, it's because I'm an unmitigated pageview whore.